The Cocker Spaniel was originally bred to be a working gundog, but their happy, patient and kind natures have made them an ideal family pet. There are two strains of Cocker Spaniel: Field and Show. 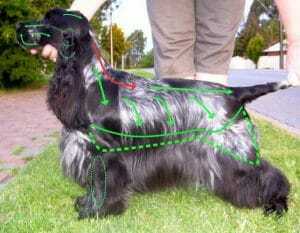 The field strain tends to have a leaner build and the show dogs have a more heavy & sturdy build. The Cocker Spaniel has long ears which lay close to the head. Their top-line should gently slope from shoulders to tail. The tail is held level to the body. Their coat should be silky and flat against the body and should never be wavy or wiry. The front and rear legs should be well feathered. The body and head of a Cocker Spaniel can be carded and/or hand-stripped to encourage the coat to lay tight to the body. Many pet owners prefer for the coat to be clipped, but it is a good idea to card (remove dead undercoat) after clipping as this promotes better skin health and can help preserve the brilliant colours of the coat. Standard blade lengths for pet grooming include: #7F, #5F, #4F or Short Comb Guides (anything up to ¾ inch). Remember to card coat after clipping to promote skin and coat health. A conditioner is always useful in the longer areas of the coat, to weigh it down and add strength and shine. It can also help protect the coat while brushing.